Mother Nature has delivered her wrath for a second time at Macon IL Speedway. Dry conditions during the morning hours had everyone’s hopes up for a great night of racing, but radar was showing heavy rainfall approaching. 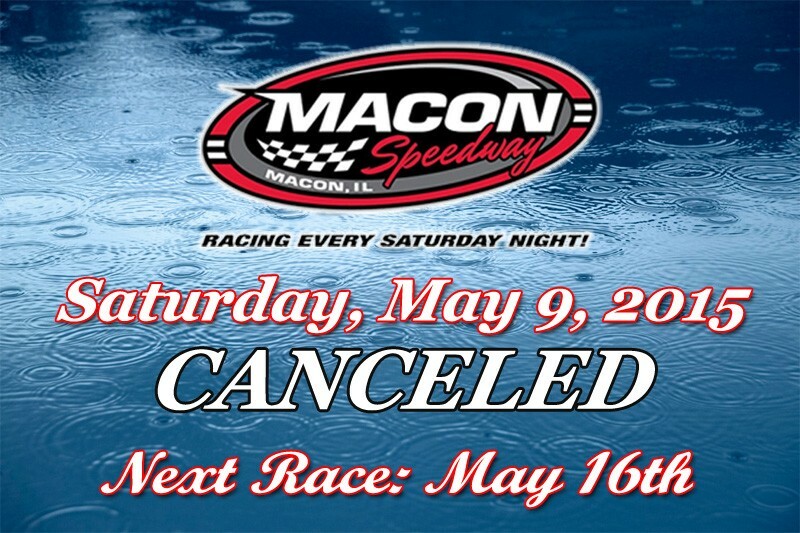 The impending weather, on top of what was received on Friday was enough to cancel most area tracks, including Macon, whose officials reluctantly pulled the plug around 2:00 after raindrops started to fall. The May 9 rainout is the second cancellation of the 2015 campaign. *This now gives you time to head to Secret Garden at 664 W Eldorado to buy your mom a bouquet or vase for Mother’s Day. They are open until 4:00 this afternoon. Scheduled to run were the Super and Pro Late Models in the Big Ten Series opener, paying $1,200 to win and $125 to start. That race will be rescheduled with a big announcement coming later this week. The Billingsley Towing Modifieds, B-Mods, Street Stocks, and Hornets were also on the card. Eyes now turn to the Saturday, May 16 program with the fast and nimble POWRi Lucas Oil Midgets and POWRi Speedway Motors Micros. Those two classes will be making their Macon season debut after being rained out on April 25. Drivers should be revved up and ready to go after having their weekend events at Belle-Clair and Farmington postponed. A number of Micro competitors did get the chance to tune in their rides on the 1/5-mile in a non-sanctioned race on May 2. Pit gates open Saturday, May 16 at 3:00, grandstands at 4:00, hotlaps at 6:00, and racing will begin at 7:00. General admission is $15 for adults, while children 11 and under are free.